I have a huggee love/hate relationship with Topshop. It's love because they constantly come up with relatively inexpensive stuff that is bang on trend then it's hate because I pretty much end up giving all my wages back to my employer every month! I have a major beef with the jewelery though..it looks so cute at first but then tends to go green or black or just generally fall apart which put me off for a longgg while. But I decided to venture back recently and saw alot of stuff that I liked and will be picking up on pay day! I picked these up yesterday at Topshop and thought they were chav-tastic enough for the party! There a quite a few of these name necklaces around at the moment. There were other ones like "Baby","Bonkers" ,"Trashy" and "Ohlala"
I also bought a ring from Miss Selfridges but it has mysteriously dissappeared! I have a feeling my sister might have "borrowed" it. Gah..little sisters! Anyways hope everyone is having a not too shabby week. p.s: Back to school/uni soon UK people! Dreading it?? I LOVELOVELOVE the colour purple but I hate frost finishes in cosmetics of any kind. So its just been sitting un-used in my drawer for yonks. So here's a look I came up with: Gold and berry on the lid and a wash of the purple on the lashline. I have to admit I don't hate it! I think I'll make the purple even brighter next time so it really pops. 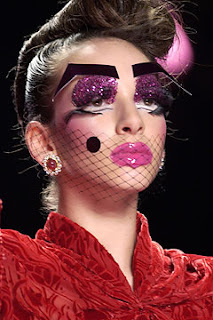 Has anyone else had one of those "thought I'd hate it but I love it" moments with make-up recently? p.s: My new followers are greatly appreciated. Thanks a million! I picked this up at work yesterday and have been painting on coats and coats since I got it home,it's gorgeous! Pink Flamingo is a perfect summer colour and is a refreshing change to the sea of coral polish that has been doing the rounds recently. I love coral as much as the next girl but you need to switch it up sometimes,right? I should be getting a new tattoo tomorrow! I'm sososo excited! Update tomorrow. So I just stared at her kind of stalker-ish. But I don't care it was worth it! Her make up was very natural ( if she had any on at all) and her skin was FLAWLESS! Such a massive inspiration! Why? : Because it's just so 'out-there'. 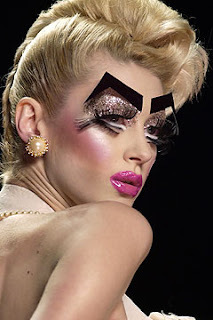 It's extravagant and *so* not work-able in real life and adds to that element of fantasy that's present on the catwalk. Who's your fave make-up artist? What's your favourite look? 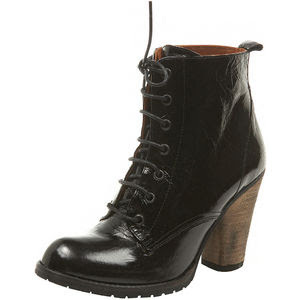 I absolutley,positively have to have these boots by the autumn. I've been checking Topshop online and in the store every day but they still only have the red ones in stock! So I'm waiting with fingers crossed that they will come in soon because they HAVE to be mine! I know it's only just August but who else can't wait for Autumn?! Maybe it's just me! Finally a FOTD and a little haul that I got a few hours ago. Oh yeah, and a big THANK YOU! to all my followers! Thanks a lot you actually made my day! Friday was pay day so I got a new nail colour to add to my already excessive nail varnish collection! I have a slightly dangerous obsession which I really need to stop. I went to the Barry M concession in Topshop Oxford Circus and got this amazing pink. It's called "Marshmallow Pink" but to me it's more of a sort of cool toned peach. I absolutley love the colour! I didn't think it would go to well with my skintone because pastels rarely do,but I think it's a nice change from my neons! The colour pay-off is pretty true to the bottle but for me personally it took me about four coats for it to be truly opaque. Then I picked up my HG of top-coats "Sally Hansen Mirror Shine". It dries supersuper fast which is good for someone like me who screams "EFF IT IT'S SMUDGED!" every time I paint my nails because I'm too imapatient to wait for it to dry! That's all for now because I've just got back from work and am majorrr tired!